BBC NEWS | South Asia | Who's afraid of the six-party alliance? Who's afraid of the six-party alliance? Four years ago, Pakistan's largest religious alliance - the Muttahida Majlis-e-Amal (MMA) - was under fire from secular parties for being the blue-eyed boy of the country's powerful military establishment. 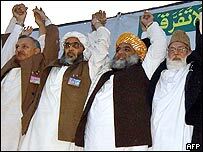 The unprecedented success of the six-party alliance in October 2001 general elections was attributed by their rivals to the support lent by Gen Pervez Musharraf's government. Today the alliance is accusing the government of trying to hound it out of the political arena. 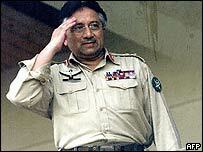 Over the past two weeks, President Musharraf has repeatedly urged people to "shun retrogressive and orthodox politicians". In the run-up to local elections, being held on 18 and 25 August, his pleas have been interpreted to mean the MMA has clearly fallen out of favour with the military government. "The government needs to be seen to be dumping its religious allies, so it is doing just that," says Dr Asad Sayeed, a political economist. "Whether it is a tactical move or a strategic one - to use military parlance - remains to be seen," he says. Dr Sayeed believes that the "military and the mullahs remain long-term bedfellows" and the apparent tensions between the two are temporary in nature. But his contention is contested by the MMA. "We are facing a situation where President Musharraf has himself emerged as our greatest adversary," says Prof Ghafoor Ahmed, a senior Jamaat leader. "There is little doubt now that we will soon be facing the wrath of his administration." Many are inclined to believe that Prof Ahmed's apprehensions are not mere political rhetoric. On Monday evening, Karachi police chief Tariq Jamil said that four terror suspects arrested over the weekend had admitted to being members of the Jamaat-e-Islami - a key member of the MMA. Mr Jamil said the four suspects were part of a 21-member gang which also included activists of the party's student wing, the Islami Jamiat-e-Tulaba. 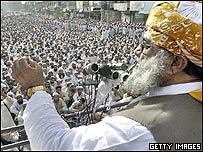 The gang had planned to carry out attacks in Karachi during local elections, he said. The Jamaat denied these claims, arguing that if the government was confident then it should prove the linkage in a court of law. Leaders of the Muttahida Qaumi Movement, the Jamaat's main rival in Karachi, were quick to seize the opportunity. Farooq Sattar, MQM leader, said that the police chief's statement had established Jamaat's links with al-Qaeda, and called for an immediate ban on the party. MQM has been accusing Karachi's former mayor, Naimatullah Khan, of corruption. Besides a barrage of daily press statements, the party has put up billboards all over the city detailing expenses of the Jamaat-backed Mr Khan when he was mayor. Few of these allegations have stuck - given Mr Khan's clean reputation - but the venom in the MQM's campaign has increased steadily in the run up to the polls. In a newspaper interview last week, President Musharraf accused the Jamiat Ulema-e-Islam of aiding the Taleban in Pakistan's border belt with Afghanistan. It was the first direct reference that he has made to possible linkages between Islamic militants and mainstream religious parties. Observers believe that the three-year understanding between religious parties and the military government - which allowed the two to coexist despite differing views - may be nearing its end. Some argue that if the MMA loses a majority of the districts in local elections in North-West Frontier Province it may be only a matter of time before the religious parties find themselves in the political wilderness again.